Making a mug is a creative way to make original artwork to keep or give as a gift. Each mug set includes a paper insert that can be decorated with crayons, markers, glitter glue, and more. Just decorate, insert, snap together, and it's complete! 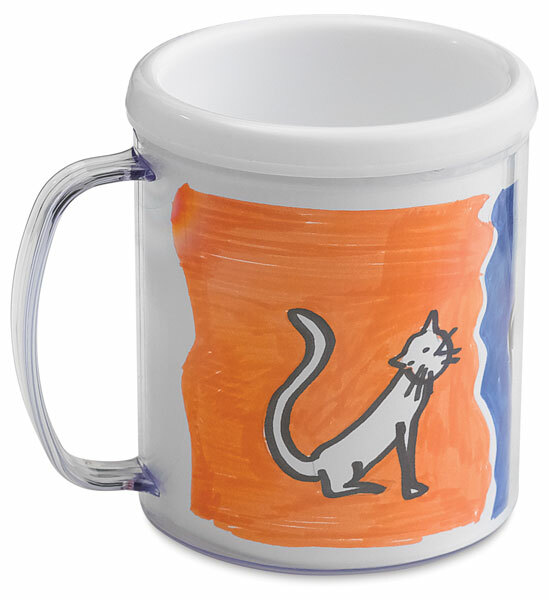 The durable plastic mug has a large clear handle that fits adult hands, and its secure snap-in liner keeps artwork safe and dry. These mugs have an 11 oz (325 ml) capacity, can be used for hot or cold liquids, and are great for large families or classrooms where personalized mugs are a must. Dishwasher washing is not recommended. Hand-wash only.